Right off the top, I want to tell my dear readers that I really enjoy running demo/participation games at conventions. I find great satisfaction in introducing players to new games, and even more satisfaction when they like the games so much that they go out and buy it to play on their own. This is not so much a battle report, but rather a quick summary of the Demo. Let’s take a look at a Demo Game of Frostgrave: Ghost Archipelago that I ran at a local Convention. This is not the first demo game that I ran, but it was the first convention game of Ghost Archipelago that I ever ran. Of course, I ran a practice demo game at a local store before the event. You will even notice that the gaming table layout is nearly the same between the practice table and the first game I ran. 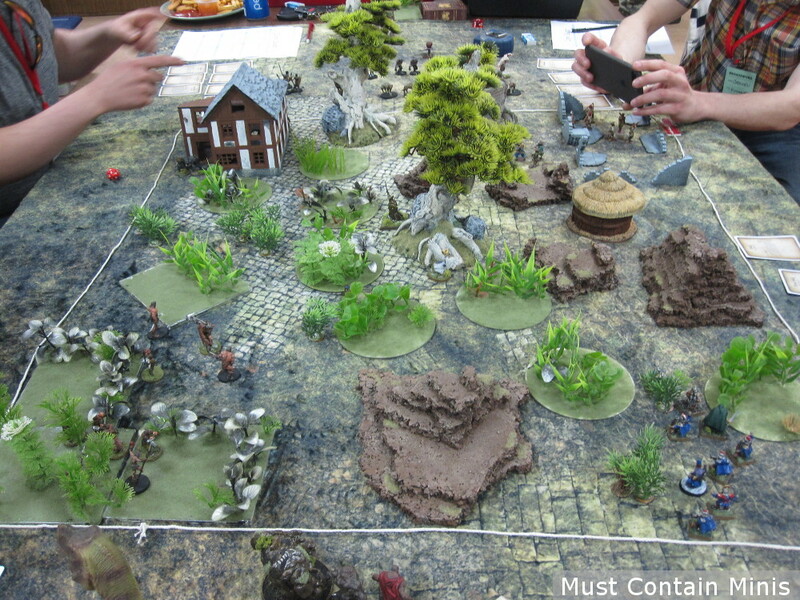 Above is the demo table from the first game I ran of Frostgrave: Ghost Archipelago. 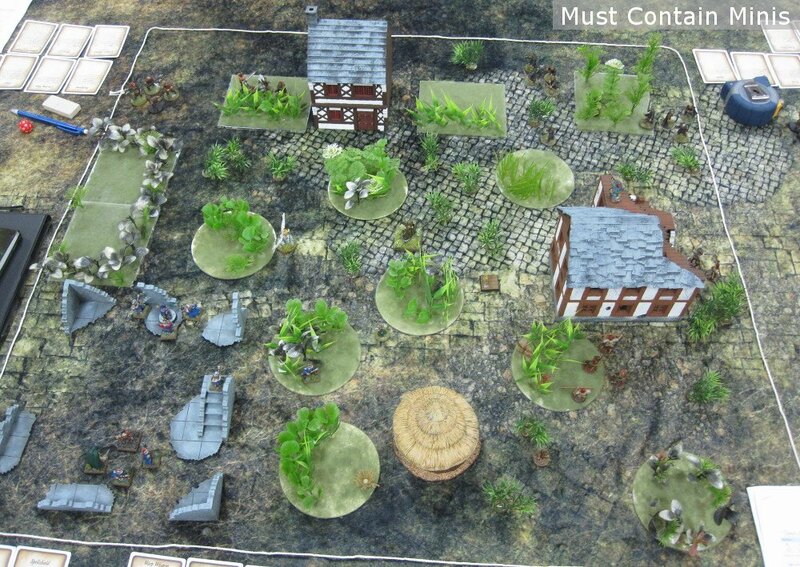 Typically, I run my Original Frostgrave demo tables as a large multiplayer skirmish on a 6′ by 4′ or 4′ by 4′ table. For this one, I decided to do something different. Instead, I ran Ghost Archipelago on a 3′ by 3′ table with up to 4 players (on the bigger tables I would run 8 players). I also changed the demo from one game to two shorter games. The reason for this is because a large part of the appeal of Frostgrave: Ghost Archipelago is its campaign game. Each game took just over an hour to play and I used the three hours allotted to me to run two back-to-back games where players got to advance their characters. That’s right, players got to level up their Heritor and Warden and make choices about what treasures to take. I modified the rules and took out bonuses for killing other player’s models, but players would get extra experience for killing wandering creatures on the board, completing conditions and getting treasure off the board. The first scenario I ran was simply a “carry the treasure” off the board inspired by the Original Frostgrave rules. The second was a hunting mission. Here, players had to chase down “moving treasure blips.” Once they touch the treasure spend an action investigating what the blip is, I would reveal either a monster or civilian. Players would get points for escorting the civilians off the board (done the same way as treasures) and for killing the monsters. The monsters represented by the blips are of course huge and powerful monsters. The most powerful, the T-Rex would be worth the most points. As I ran the game, the “points” were actually experience points from my own modified charts. The player with an alive Heritor that gained the most experience after two games. If a Heritor was taken out of action during a scenario, there was a 10% chance that the Heritor would die and the player would be out of the game. This was to encourage playing “smart” with Heritors and to discourage players from taking out each other’s main characters. It worked. This quick post is just to quickly chat about the Demo Game I ran at Broadsword 5 in Hamilton, Ontario, Canada ran by the Hamilton Tabletop Gaming Society. If you live in the area, check them out. They have another event coming up on August 25 (2018). Below are some pictures from the games that I ran at this event. 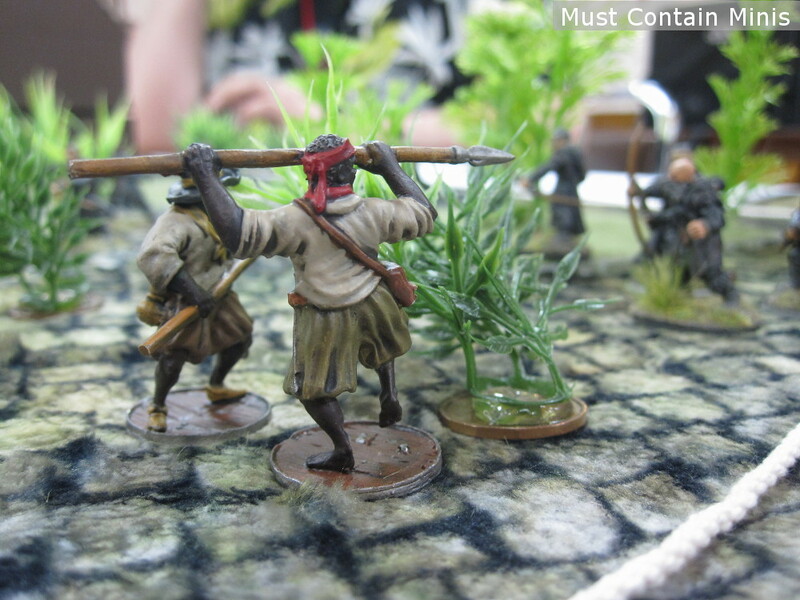 Some Spanish miniatures from Firelock Games sneak through the jungle towards their adversaries. They found their prey and the Spanish Lanceros prep for a charge! 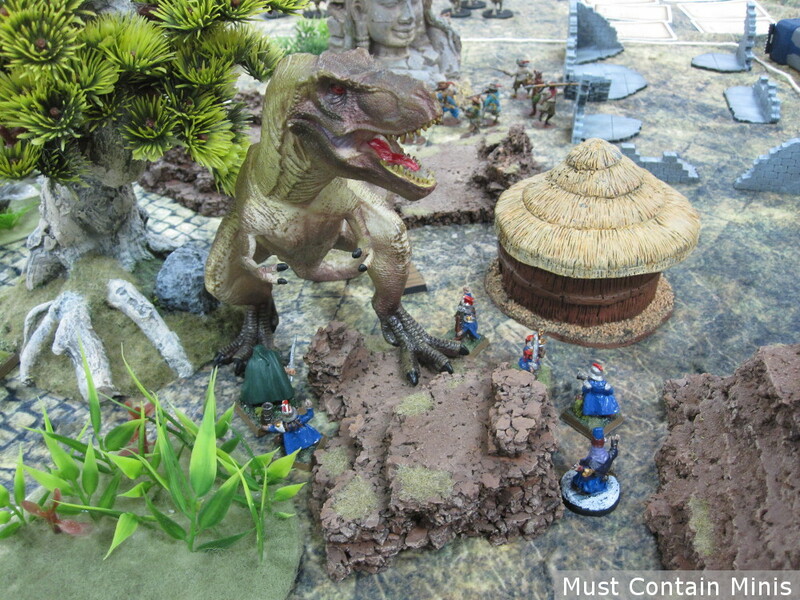 A dinosaur hears gunshots and enters the battle looking for dinner! The Dinosaur made an appearance in the second game too. This time, he was worth a lot of points to whatever warband got the killing hit on him. The Dwarf faction ran in to take this monster on!!! 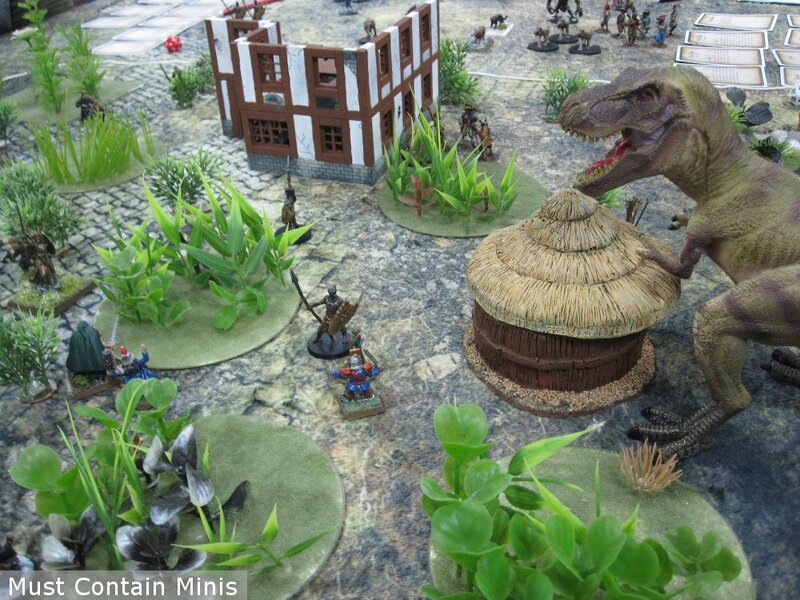 One of the things that I LOVE about demoing Osprey Games is that you are encouraged to use whatever miniatures you have. Because of this fact, I really like to mix it up with the miniatures I use to represent multiple companies simultaneously. A large part of Must Contain Minis’ mandate is to share products made by companies other than Games Workshop and I am very happy that Bell of Lost Souls helps me achieve that goal. Below is a list of what I used to set up my demo tables. Gaming mat by Cigar Box Battle. If you are interested in something like this, check out their Kickstarter today!!! It ends at 10pm EDT. Jungle plant bases made by me out of aquarium plants. Hut by Six Squared Studios. Buildings and ruins by XOLK. Rock piles made by my friend Dave out of cork. Giant Trees from an aquarium store. Dinosaur from my Local Dollar Store. 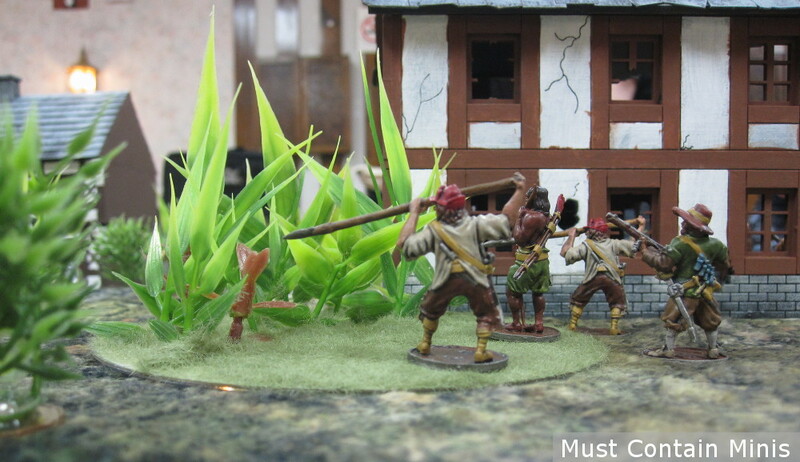 Spanish Miniatures by Firelock Games for Blood and Plunder. Barbarians by Osprey Games and North Star Military Figures. Conan and other minis from the Conan Board Game sent to my by Asmodee. In the interest of full disclosure, a special thanks goes out to the companies above as most of them provided me with review products in the past. I am especially appreciative as this kind of support really helps me deliver excellent demo experiences at local conventions. Hopefully, you enjoyed this quick post about the Forstgrave: Ghost Archipelago table that I ran at Broadsword Five. The demo itself was very successful and the table caught the eyes of plenty more people than just the four players. The table itself looked great and I had a great time introducing new people to the game. For a more in depth report with more pictures, come on over to Must Contain Minis.